Bergamot, Cajeput, Cardamom, Cypress, Eucalyptus Globulus, Eucalyptus Citriodora, Lavender, Lemon, Sweet Marjoram, Melissa, Myrrh, Niaouli, Peppermint, Ravensara, Rosemary, Rose Otto, Tea Tree and White Thyme. Over-stressed, over-worked, over-tired? This blend was created to help when you're starting to feel puny and run down. The oils chosen are carefully blended in specific proportions to create a special alternative approach to wellness. One of the great advantages of using essential oils as antiviral agents is that they can be used externally. 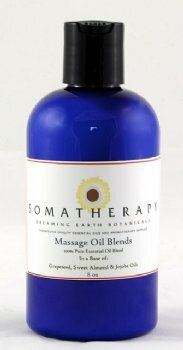 We recommend using these massage blend either by applying to the body in a massage oil (use 2 drops per teaspoon / 12 drops per ounce) or by adding a cap full to a warm bath. Disclaimer: The information provided here is for educational purposes only, and not intended to treat, prescribe, cure, or diagnose any disease or condition. This information is not intended as a substitute for consulting with your physician or other health care provider. Dreaming Earth Botanicals is not responsible for any adverse effects resulting from the use of any of the suggestions, preparations, or procedures discussed. All matters pertaining to your physical health should be supervised by a health ca re professional. Keep all aromatherapy products out of reach of children.